MAKE THE WORLD YOUR CLASSROOM. 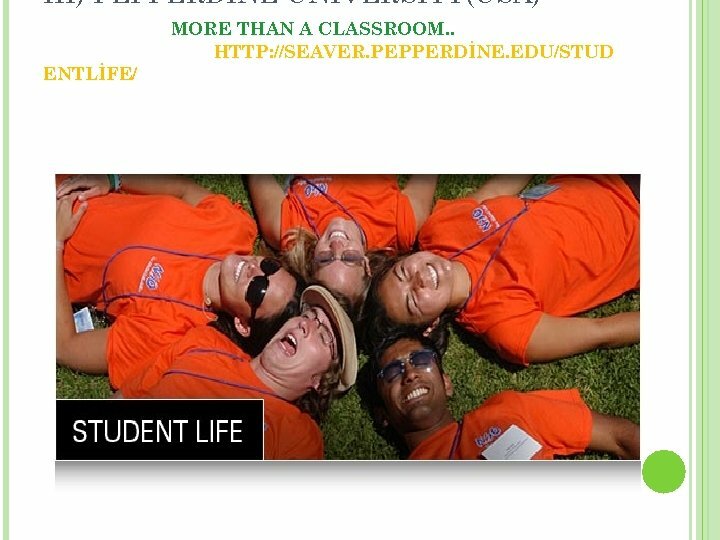 ENHANCE YOUR SU EDUCATION BY GOING ABROAD. 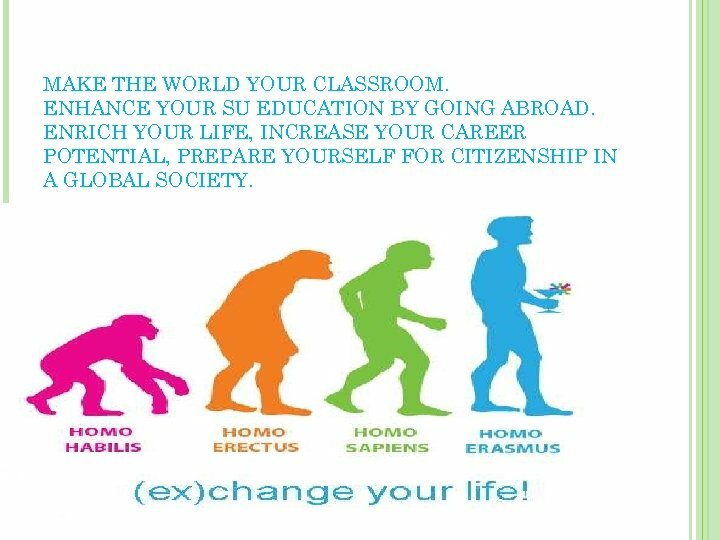 ENRICH YOUR LIFE, INCREASE YOUR CAREER POTENTIAL, PREPARE YOURSELF FOR CITIZENSHIP IN A GLOBAL SOCIETY. 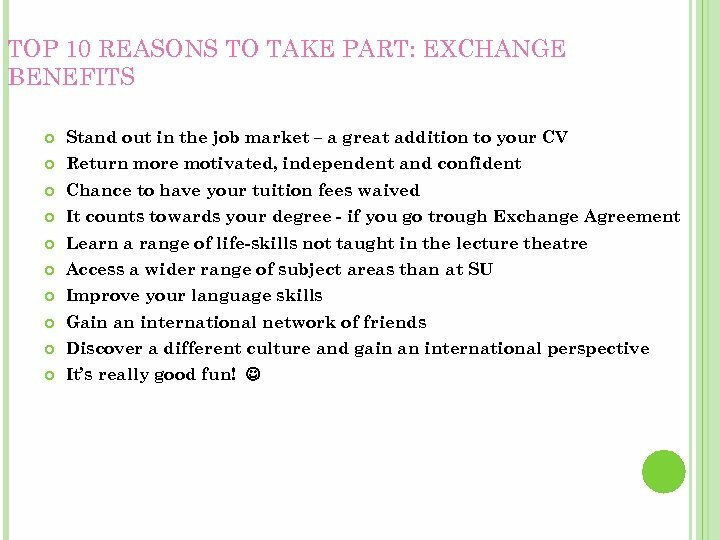 TOP 10 REASONS TO TAKE PART: EXCHANGE BENEFITS Stand out in the job market – a great addition to your CV Return more motivated, independent and confident Chance to have your tuition fees waived It counts towards your degree - if you go trough Exchange Agreement Learn a range of life-skills not taught in the lecture theatre Access a wider range of subject areas than at SU Improve your language skills Gain an international network of friends Discover a different culture and gain an international perspective It’s really good fun! 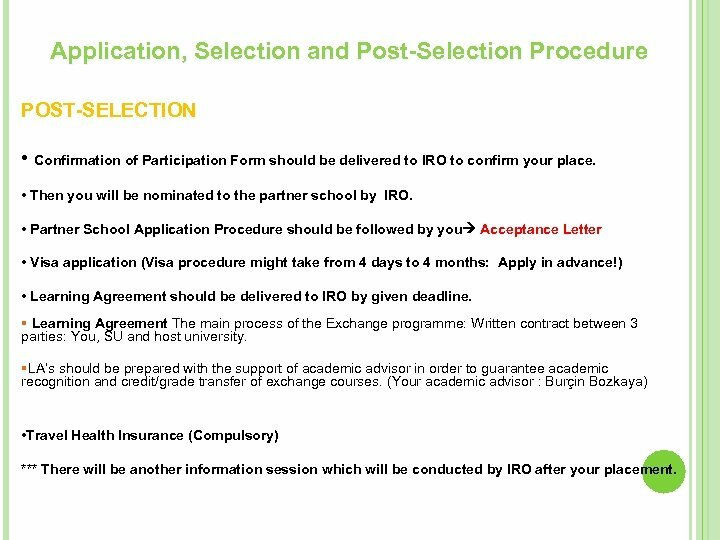 Application, Selection and Post-Selection Procedure POST-SELECTION • Confirmation of Participation Form should be delivered to IRO to confirm your place. 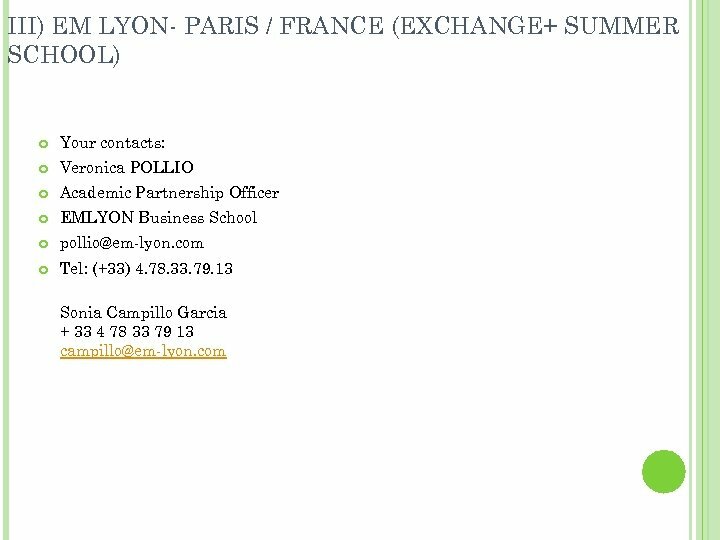 • Then you will be nominated to the partner school by IRO. 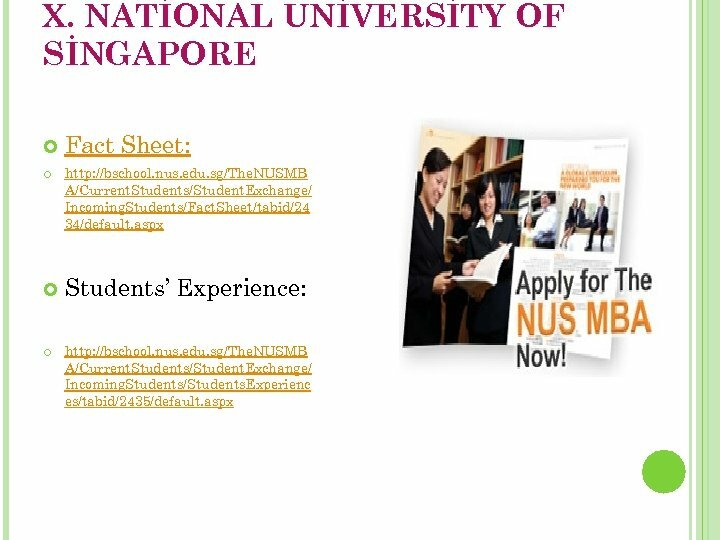 • Partner School Application Procedure should be followed by you Acceptance Letter • Visa application (Visa procedure might take from 4 days to 4 months: Apply in advance!) • Learning Agreement should be delivered to IRO by given deadline. 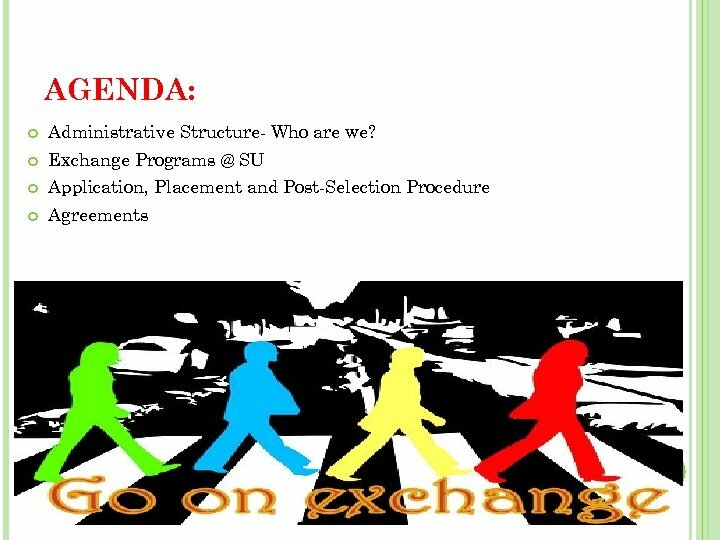 Learning Agreement The main process of the Exchange programme: Written contract between 3 parties: You, SU and host university. LA’s should be prepared with the support of academic advisor in order to guarantee academic recognition and credit/grade transfer of exchange courses. 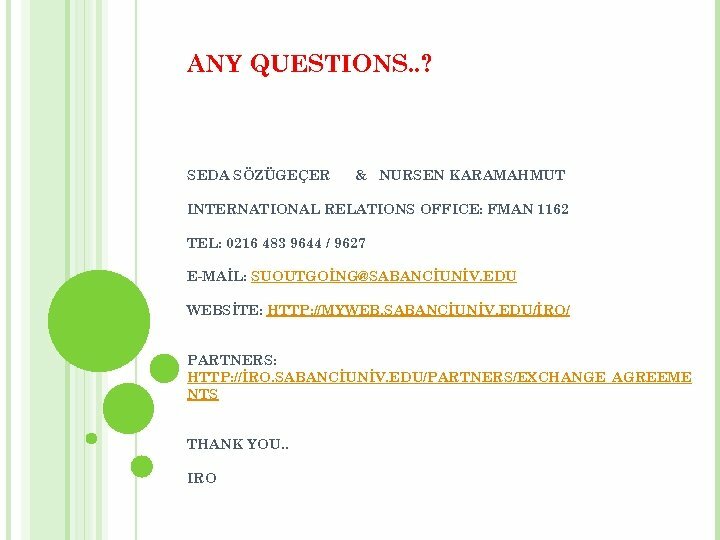 (Your academic advisor : Burçin Bozkaya) • Travel Health Insurance (Compulsory) *** There will be another information session which will be conducted by IRO after your placement. 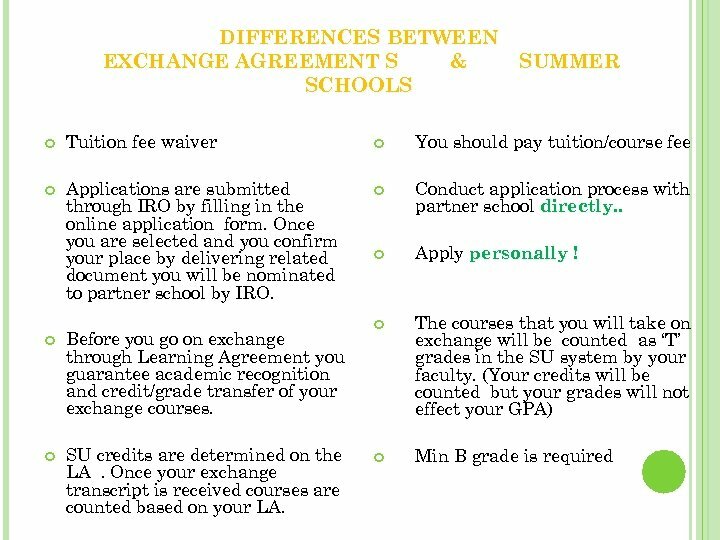 DIFFERENCES BETWEEN EXCHANGE AGREEMENT S & SCHOOLS SUMMER Tuition fee waiver You should pay tuition/course fee Applications are submitted through IRO by filling in the online application form. 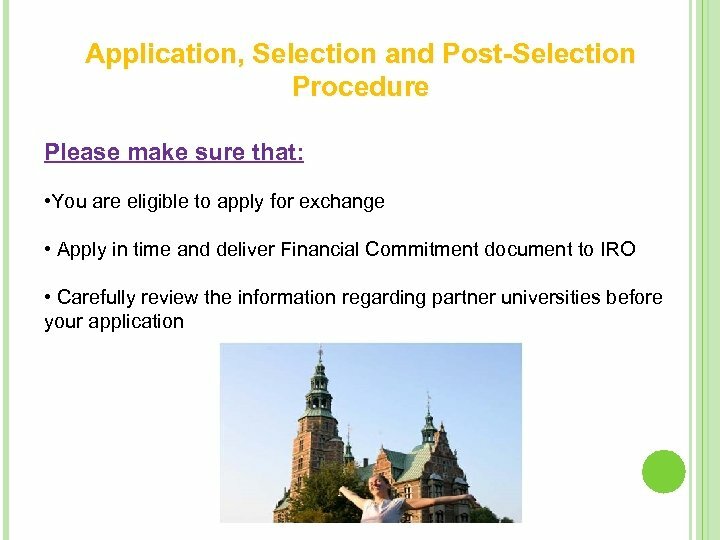 Once you are selected and you confirm your place by delivering related document you will be nominated to partner school by IRO. 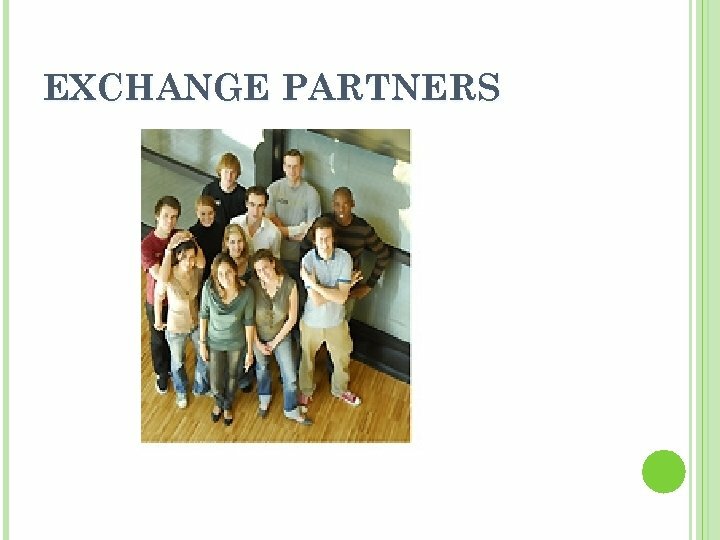 Conduct application process with partner school directly. . Apply personally ! 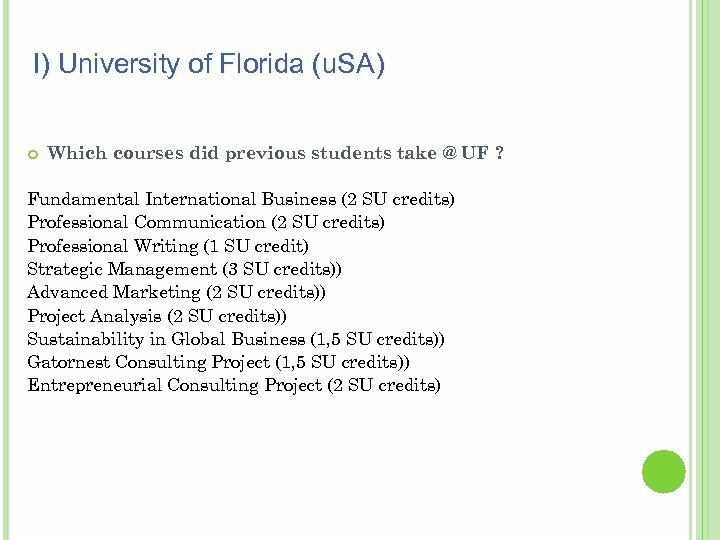 The courses that you will take on exchange will be counted as ‘T’ grades in the SU system by your faculty. 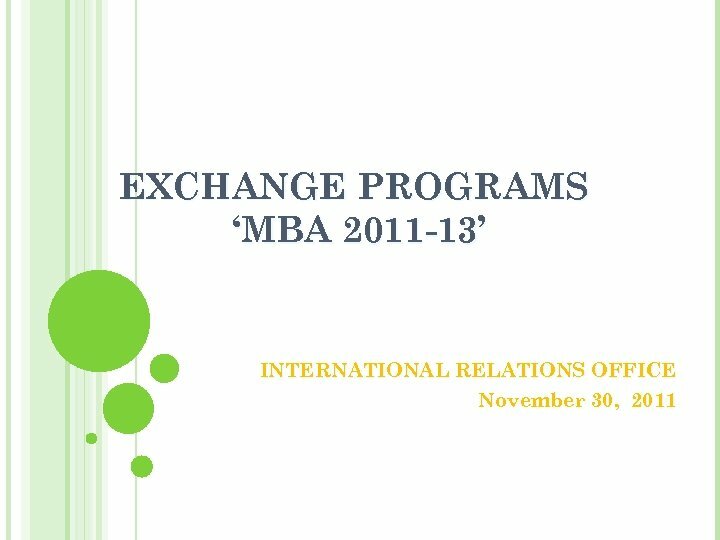 (Your credits will be counted but your grades will not effect your GPA) Min B grade is required Before you go on exchange through Learning Agreement you guarantee academic recognition and credit/grade transfer of your exchange courses. 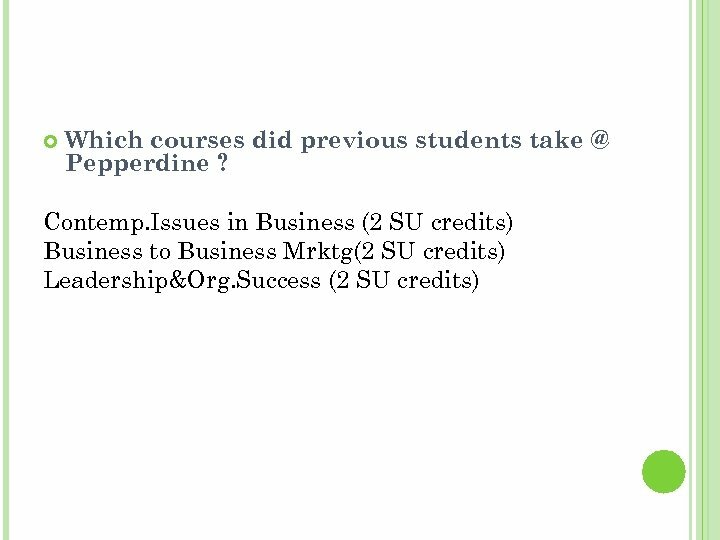 SU credits are determined on the LA. 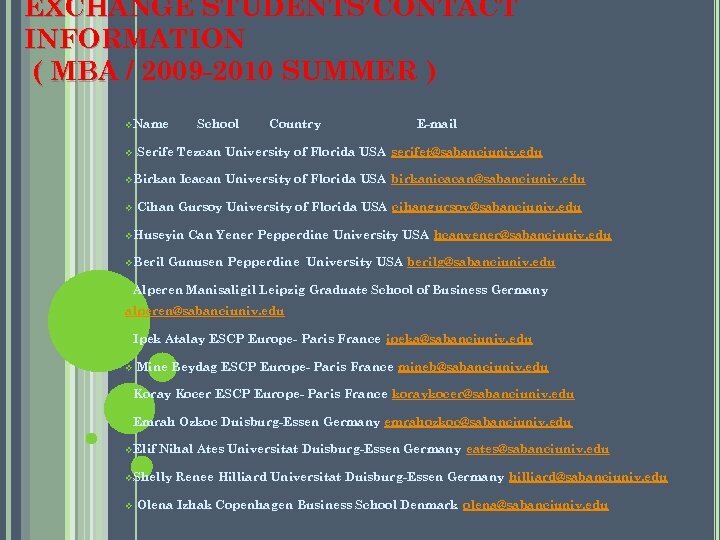 Once your exchange transcript is received courses are counted based on your LA. 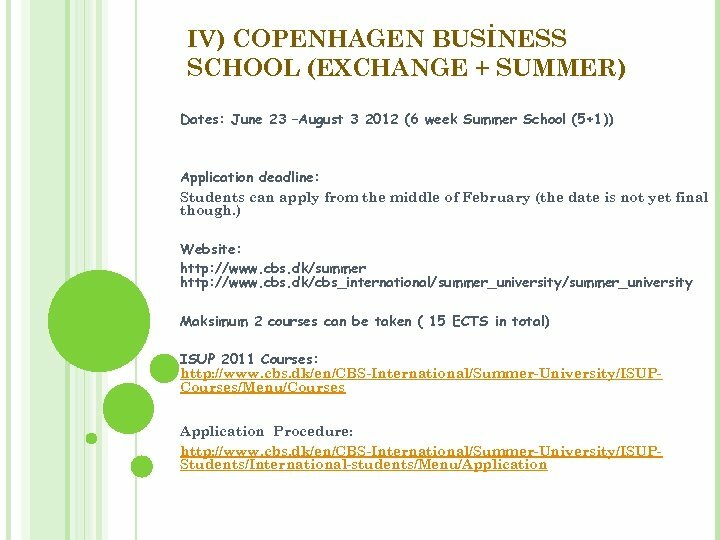 IV) COPENHAGEN BUSİNESS SCHOOL (EXCHANGE + SUMMER) HTTP: //WWW. CBS. 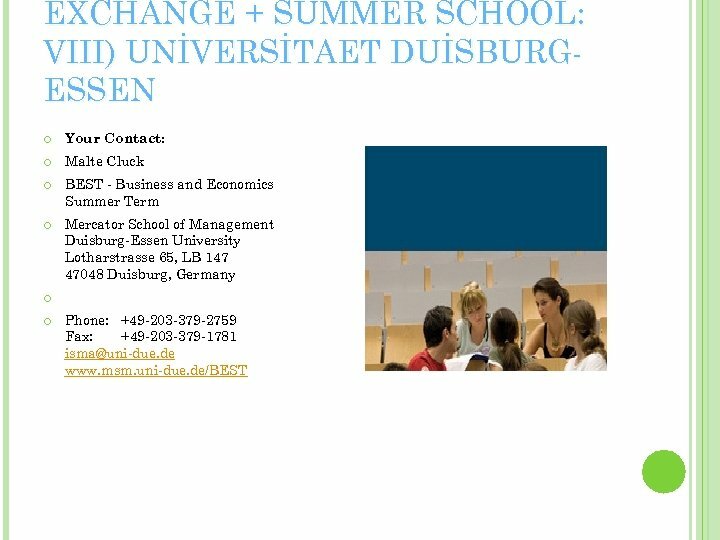 DK/CBS_İNTERNATİONAL/SUMMER_UNİVERSİTY/İSUP_STUDENTS/İNTERNAT İONAL_STUDENTS/MENU/İNFORMATİON_FAQ#COSTS Does it cost money to participate? 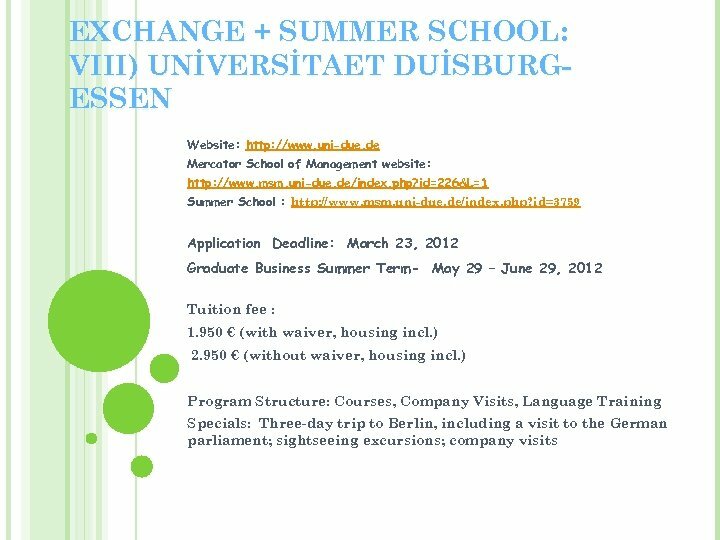 Nominated Exchange students: Students nominated by a CBS partner university don't pay tuition fee for participating in ISUP. 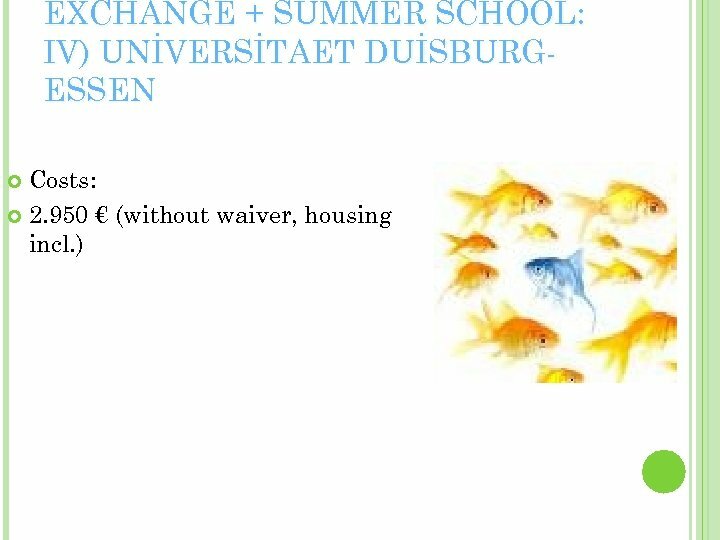 European Freemovers: Students from the EU/EEA pay the same rate as Danish Open University Students: the current price is 1750 DKK per 7. 5 ECTS on undergraduate level and 3500 DKK per 7. 5 ECTS on graduate level (except for electives under MSc in Business Administration and Computer Science for which the price is 5200 DKK per 7. 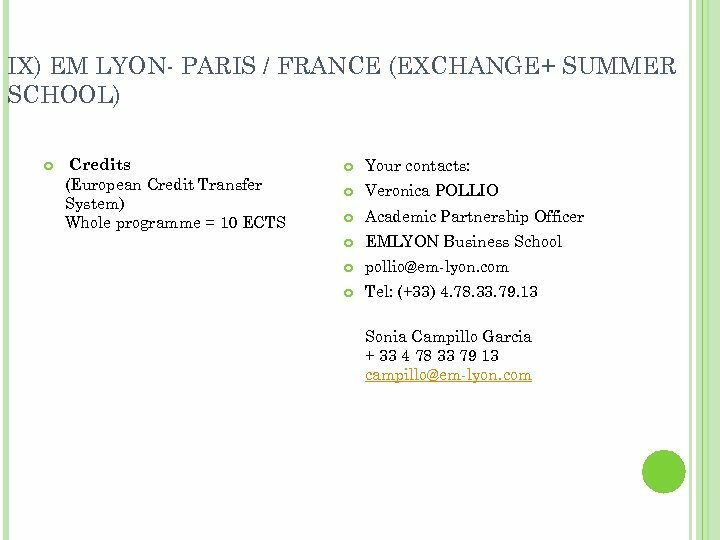 5 ECTS). 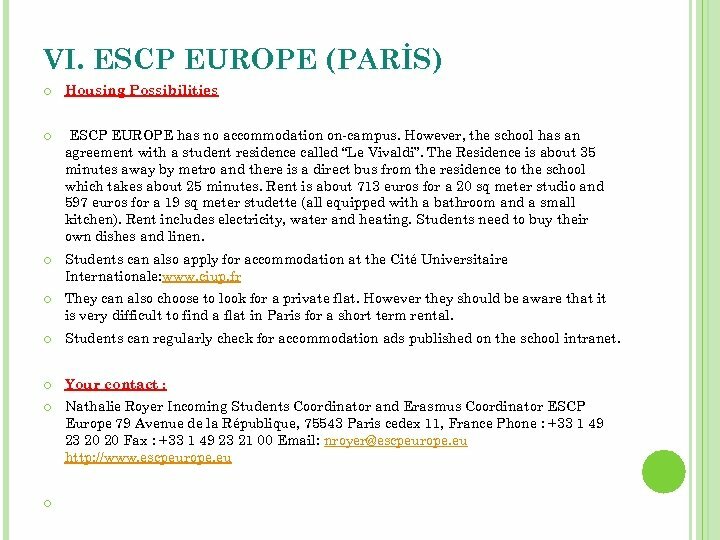 In order to qualify for this option, students must have a citizenship or a permanent residence permit to an EU/EEA country. 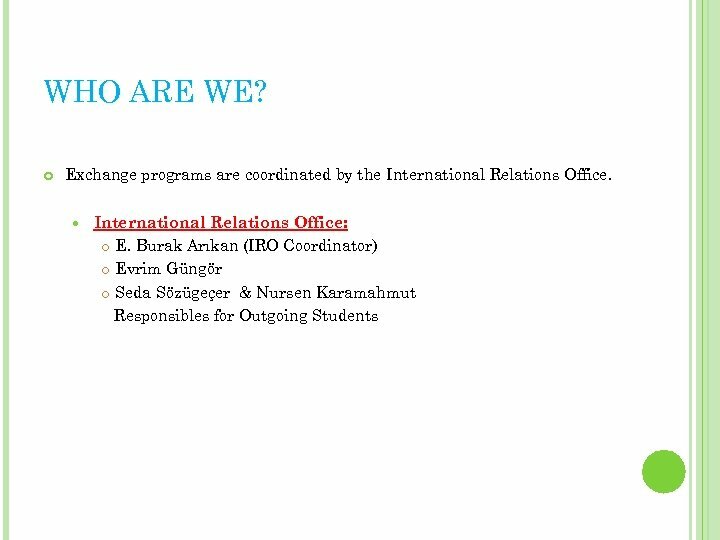 Non-European Freemovers: Students from outside the EU/EEA, who are not nominated by a CBS partner university, have to apply for ISUP as a Non-European Freemover. 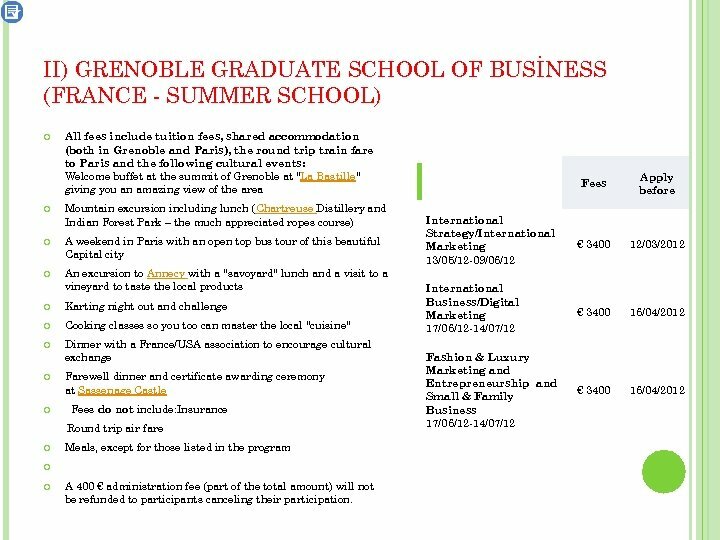 The cost of the program is 2375 EUR (approx. 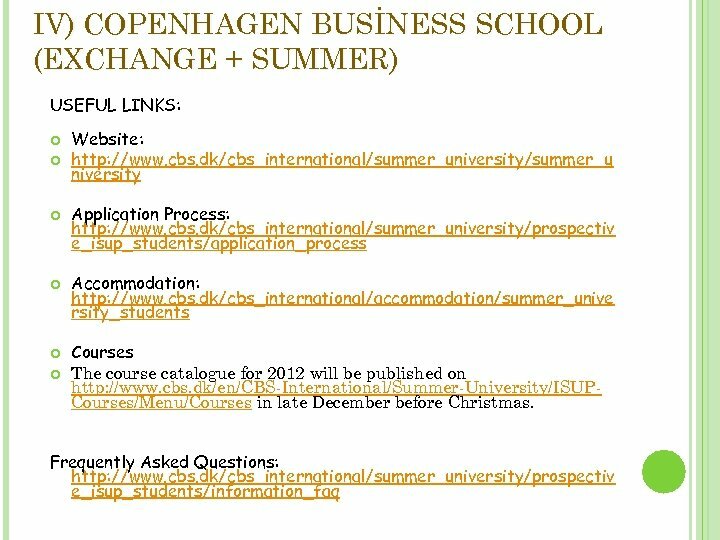 17, 700 DKK) for two undergraduate courses and 3125 EUR (approx. 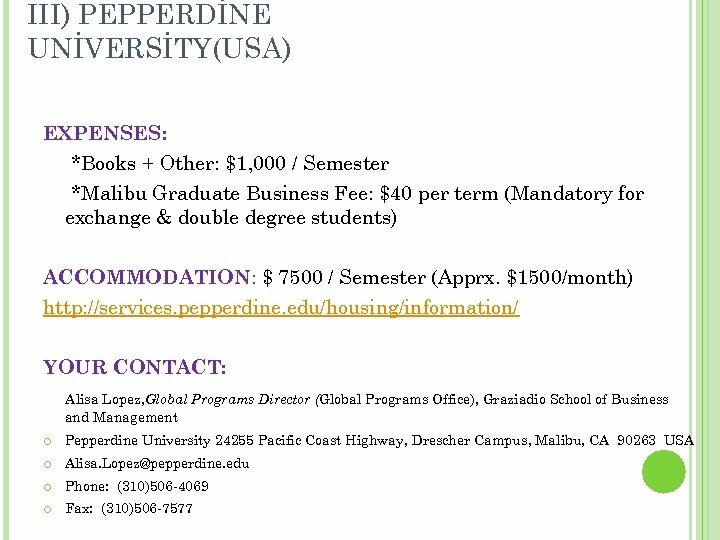 23, 200 DKK) for two graduate courses. 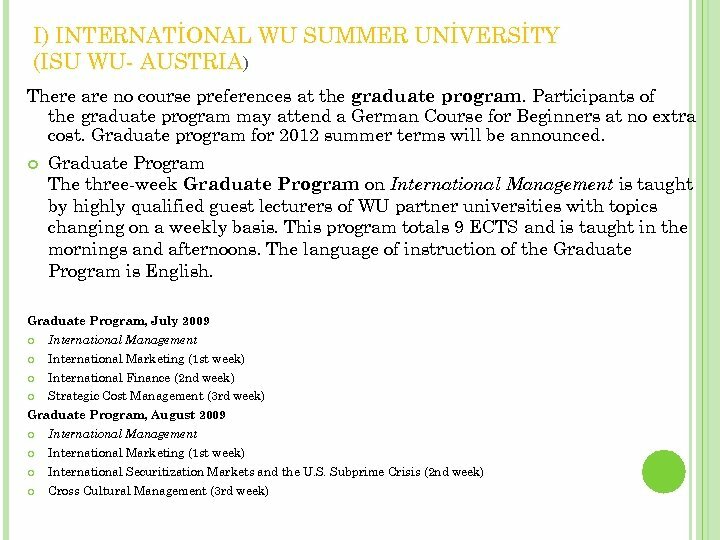 Students only participating in one three-week intensive graduate course must pay 1565 EUR (approx. 11, 660 DKK). What else should I know about the program costs as a Non-European Freemover? Non-European Freemovers must pay a non-refundable application fee of 800 DKK when applying for ISUP. 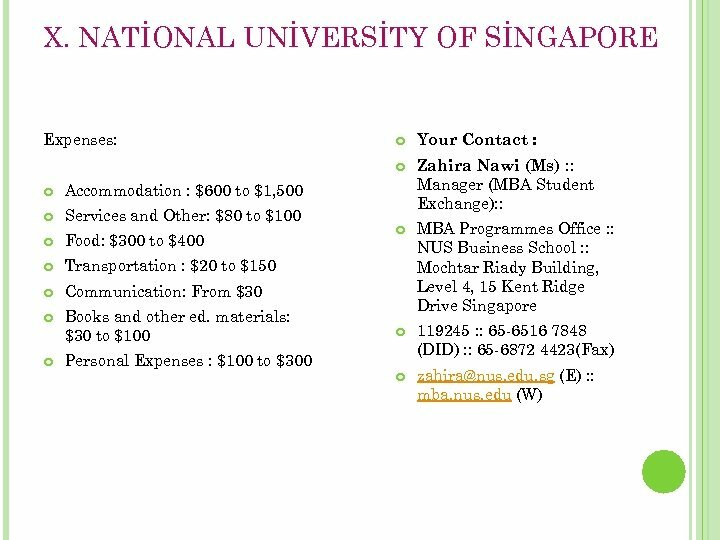 You will have to pay the application fee through our webshop. 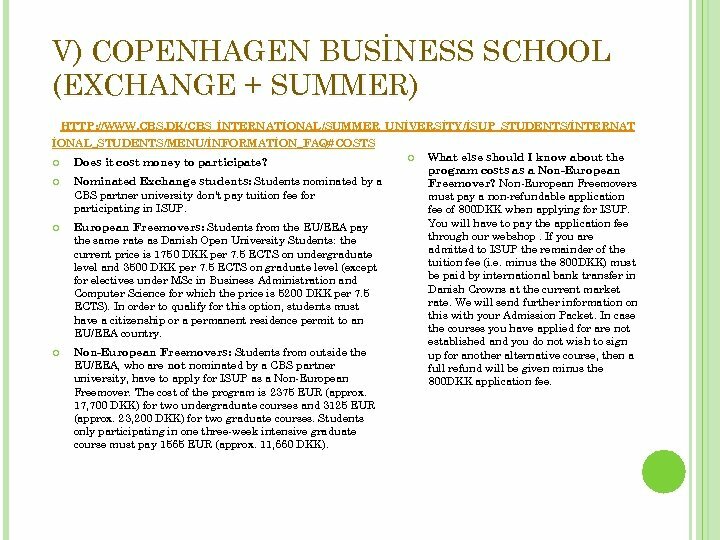 If you are admitted to ISUP the remainder of the tuition fee (i. e. minus the 800 DKK) must be paid by international bank transfer in Danish Crowns at the current market rate. 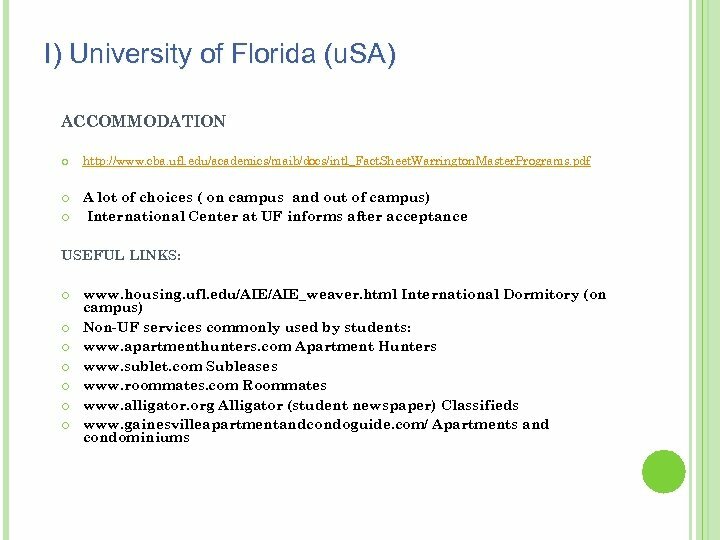 We will send further information on this with your Admission Packet. In case the courses you have applied for are not established and you do not wish to sign up for another alternative course, then a full refund will be given minus the 800 DKK application fee. VI. 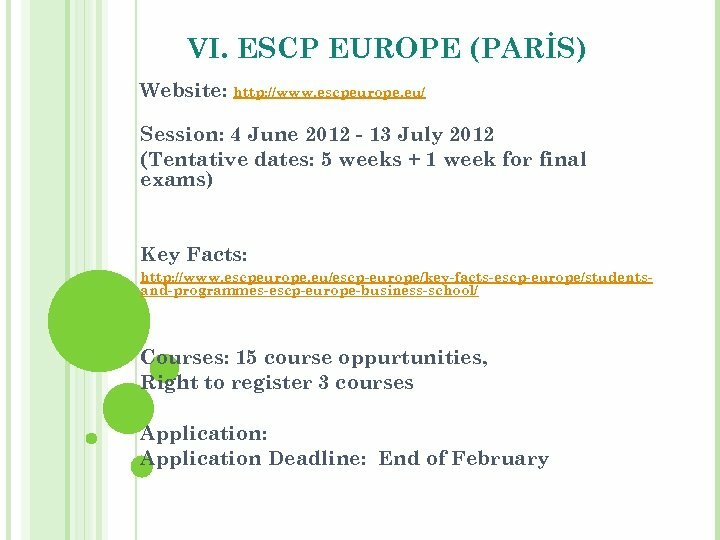 ESCP EUROPE (PARİS) Most courses are in English. 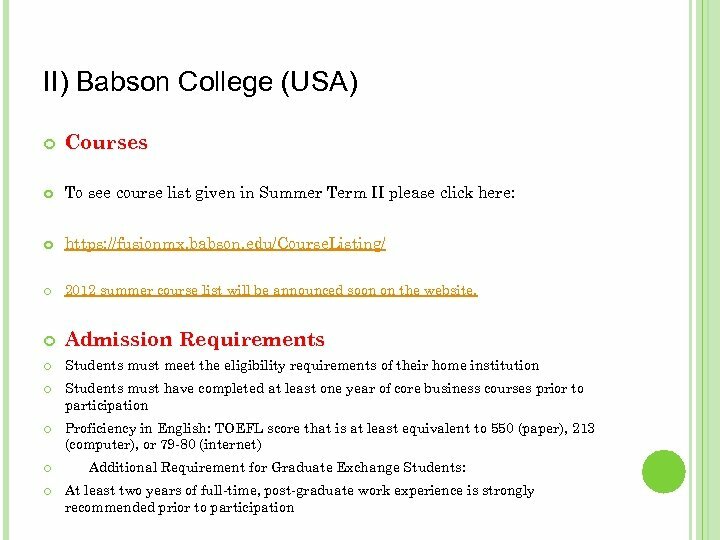 There are full courses and half courses. 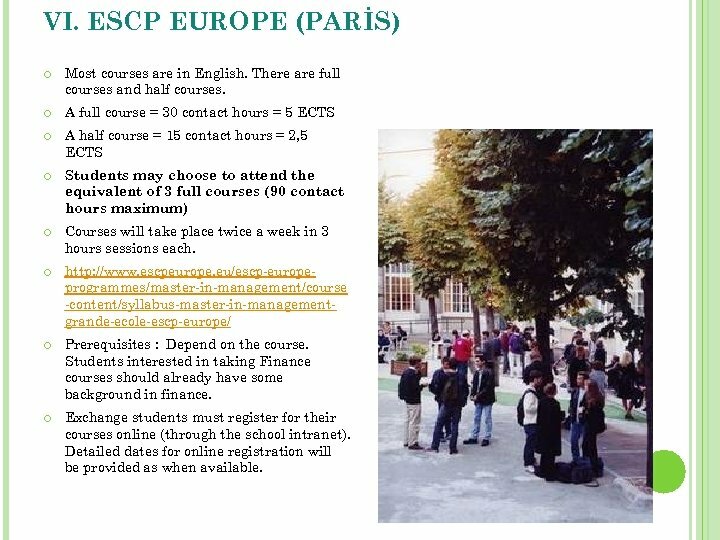 A full course = 30 contact hours = 5 ECTS A half course = 15 contact hours = 2, 5 ECTS Students may choose to attend the equivalent of 3 full courses (90 contact hours maximum) Courses will take place twice a week in 3 hours sessions each. http: //www. 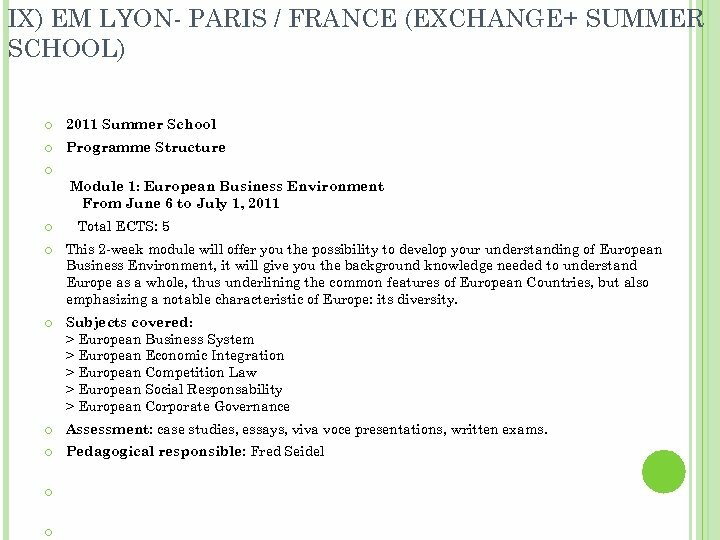 escpeurope. 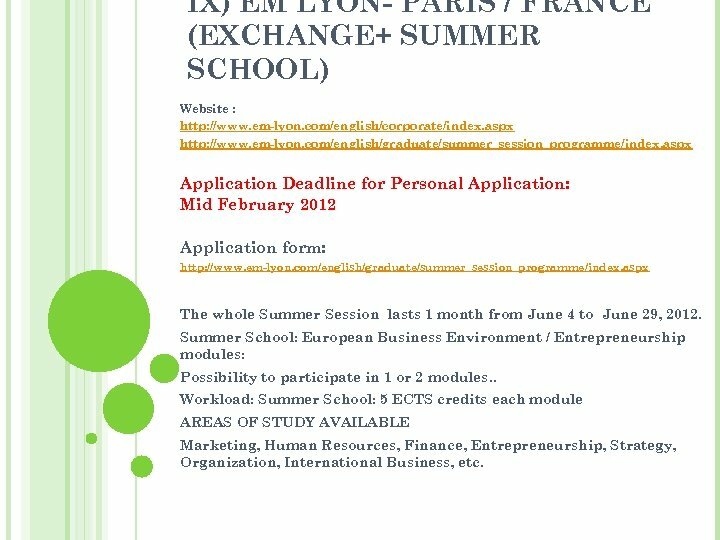 eu/escp-europeprogrammes/master-in-management/course -content/syllabus-master-in-managementgrande-ecole-escp-europe/ Prerequisites : Depend on the course. 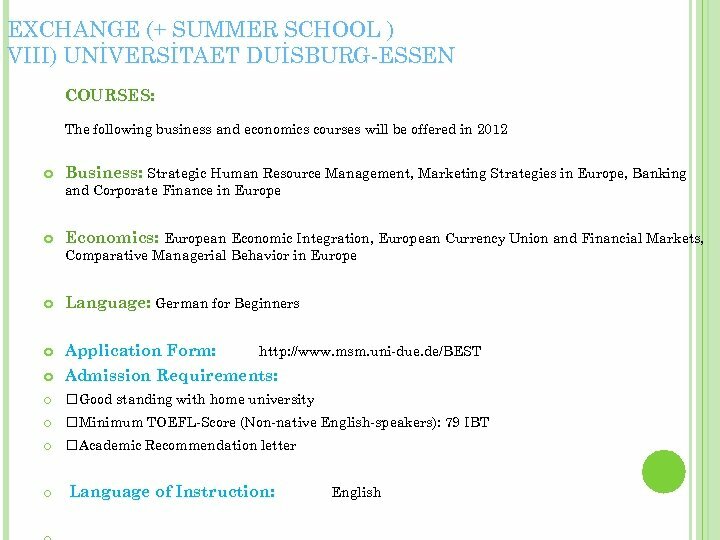 Students interested in taking Finance courses should already have some background in finance. 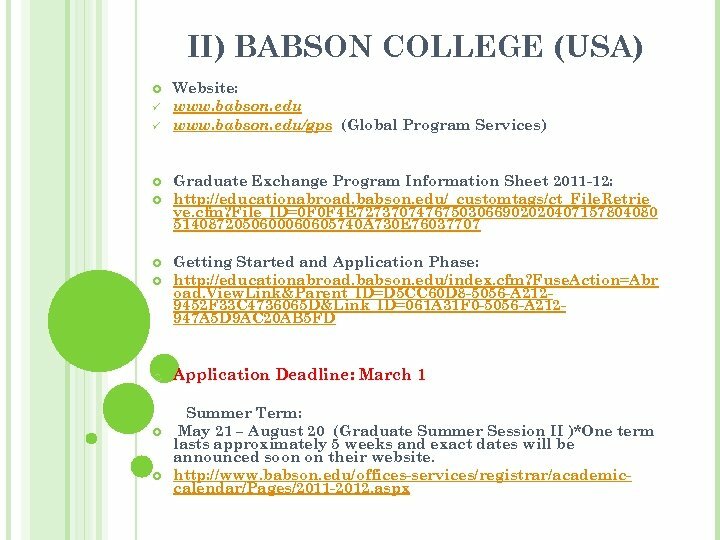 Exchange students must register for their courses online (through the school intranet). Detailed dates for online registration will be provided as when available. 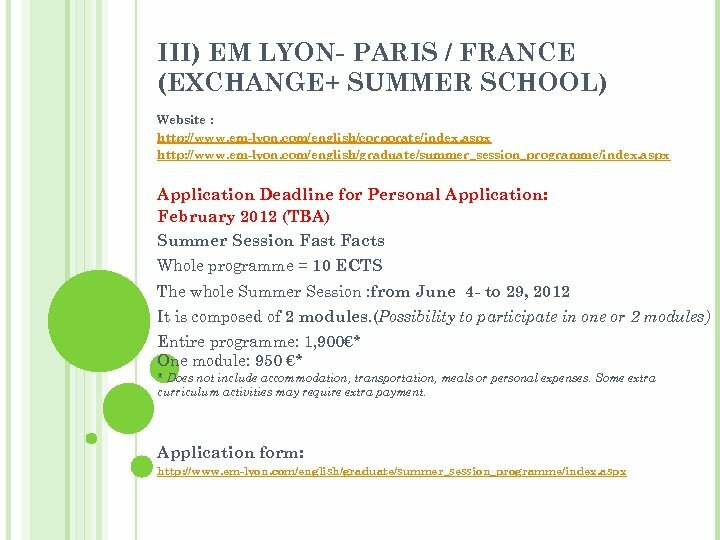 IX) EM LYON- PARIS / FRANCE (EXCHANGE+ SUMMER SCHOOL) Website : http: //www. em-lyon. com/english/corporate/index. aspx http: //www. em-lyon. 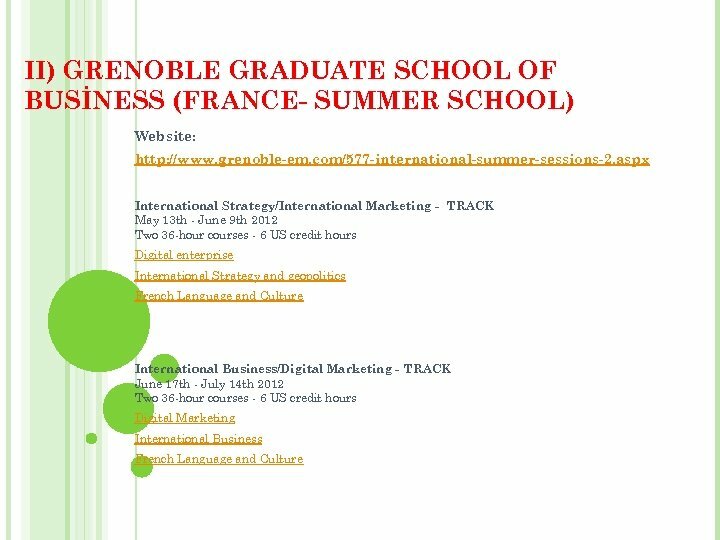 com/english/graduate/summer_session_programme/index. 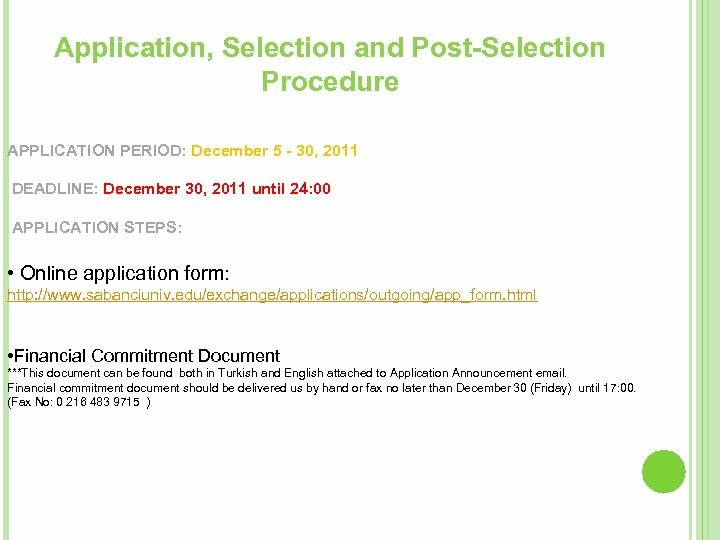 aspx Application Deadline for Personal Application: Mid February 2012 Application form: http: //www. 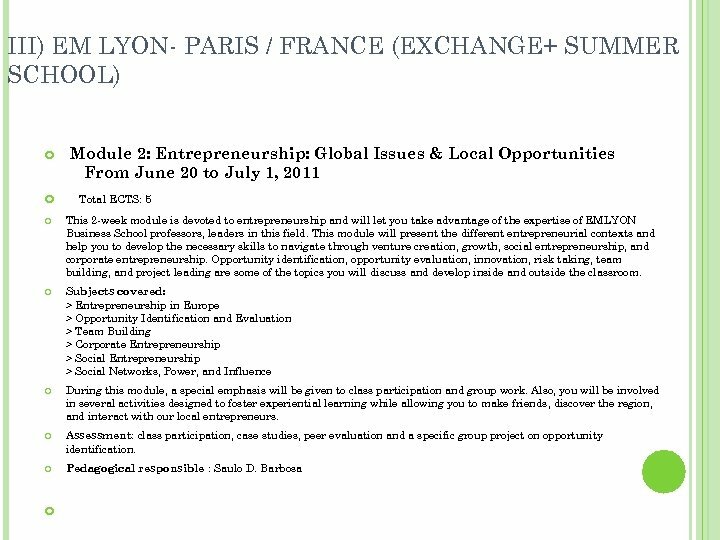 em-lyon. 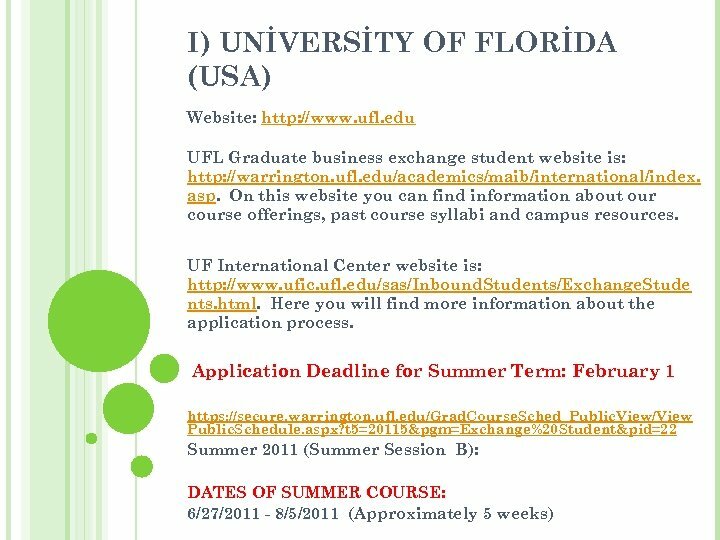 com/english/graduate/summer_session_programme/index. 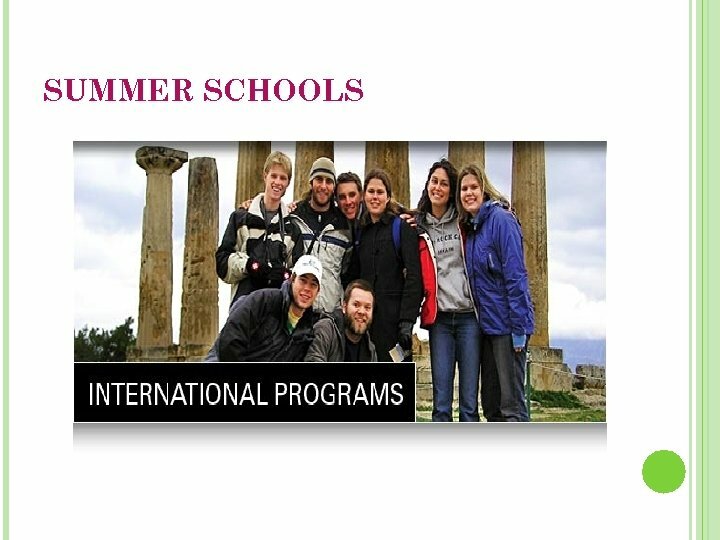 aspx The whole Summer Session lasts 1 month from June 4 to June 29, 2012. 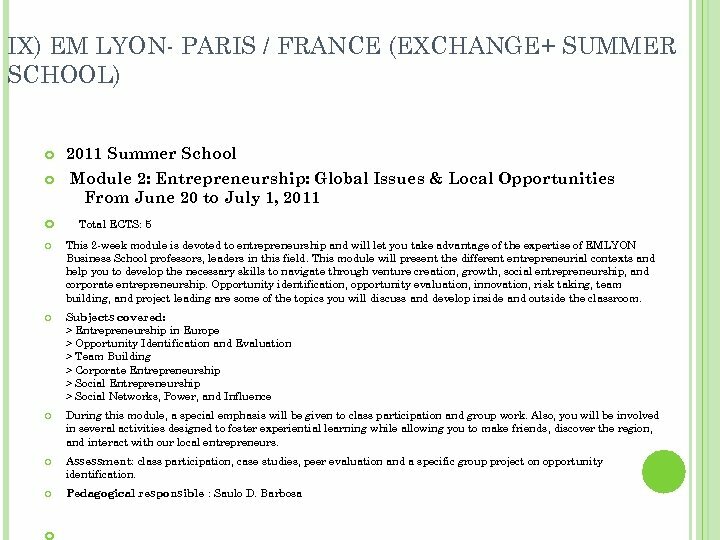 Summer School: European Business Environment / Entrepreneurship modules: Possibility to participate in 1 or 2 modules. . 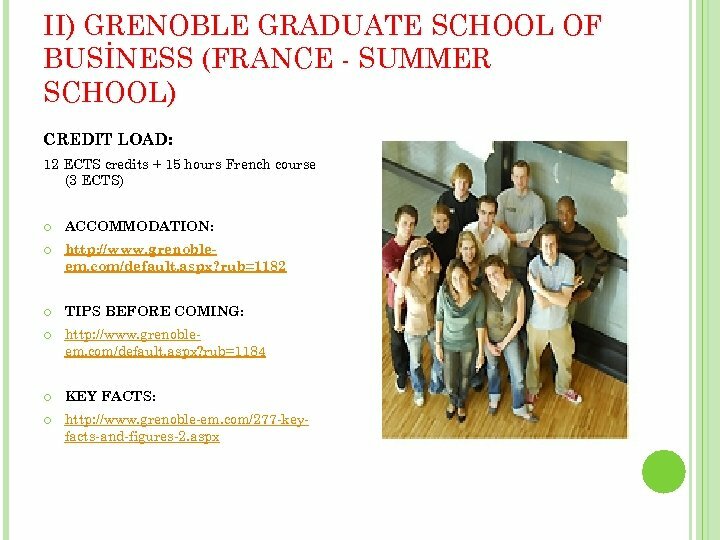 Workload: Summer School: 5 ECTS credits each module AREAS OF STUDY AVAILABLE Marketing, Human Resources, Finance, Entrepreneurship, Strategy, Organization, International Business, etc. VII. 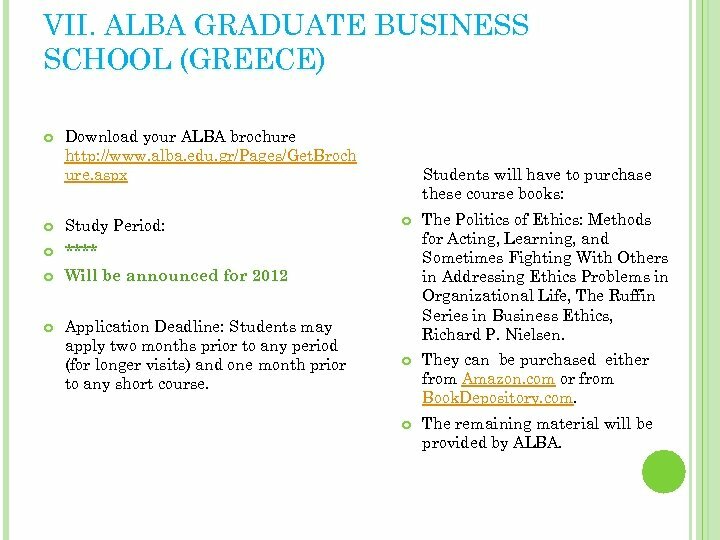 ALBA GRADUATE BUSINESS SCHOOL (GREECE) Download your ALBA brochure http: //www. alba. edu. gr/Pages/Get. Broch ure. aspx The Politics of Ethics: Methods for Acting, Learning, and Sometimes Fighting With Others in Addressing Ethics Problems in Organizational Life, The Ruffin Series in Business Ethics, Richard P. Nielsen. They can be purchased either from Amazon. com or from Book. Depository. com. 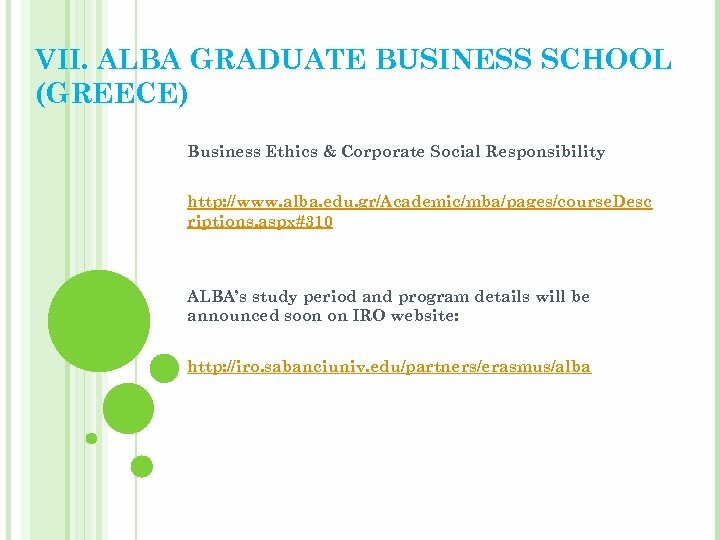 The remaining material will be provided by ALBA. 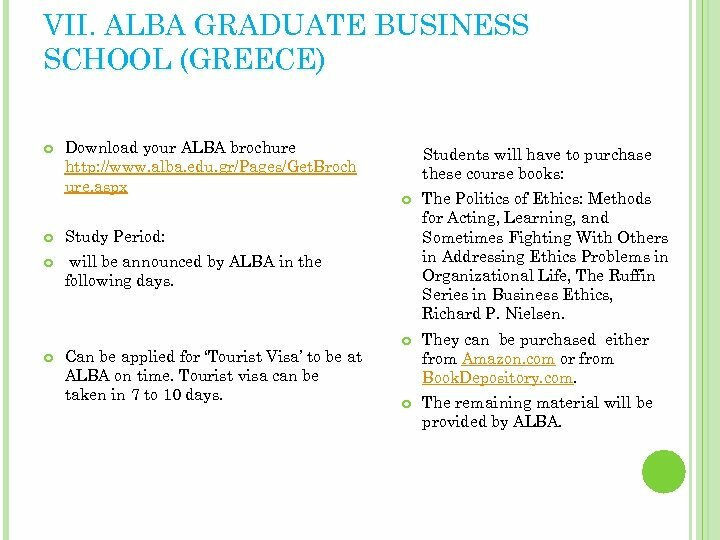 Study Period: Students will have to purchase these course books: will be announced by ALBA in the following days. Can be applied for ‘Tourist Visa’ to be at ALBA on time. Tourist visa can be taken in 7 to 10 days. 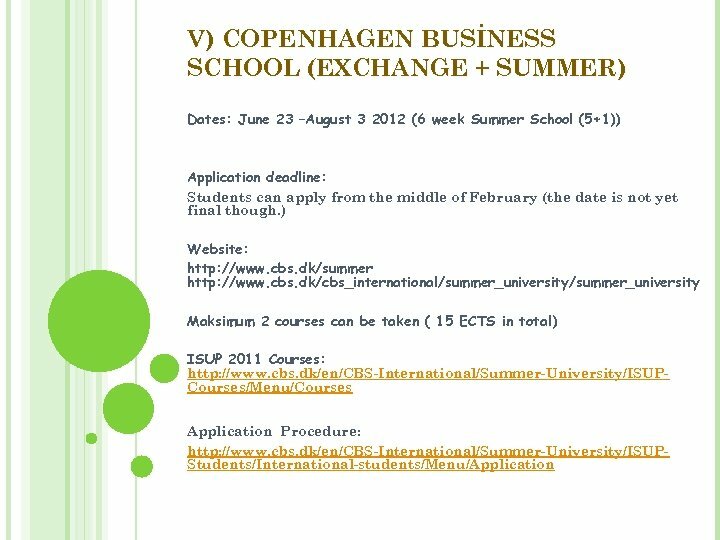 V) COPENHAGEN BUSİNESS SCHOOL (EXCHANGE + SUMMER) HTTP: //WWW. CBS. 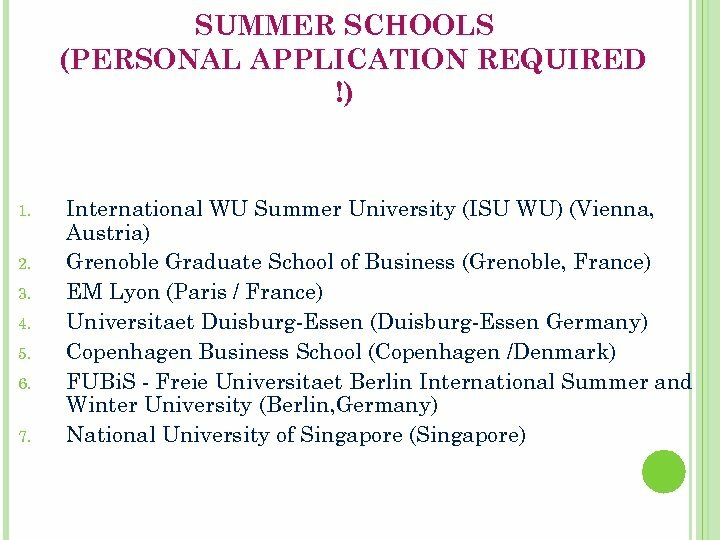 DK/CBS_İNTERNATİONAL/SUMMER_UNİVERSİTY/İSUP_STUDENTS/İNTERNAT İONAL_STUDENTS/MENU/İNFORMATİON_FAQ#COSTS Does it cost money to participate? 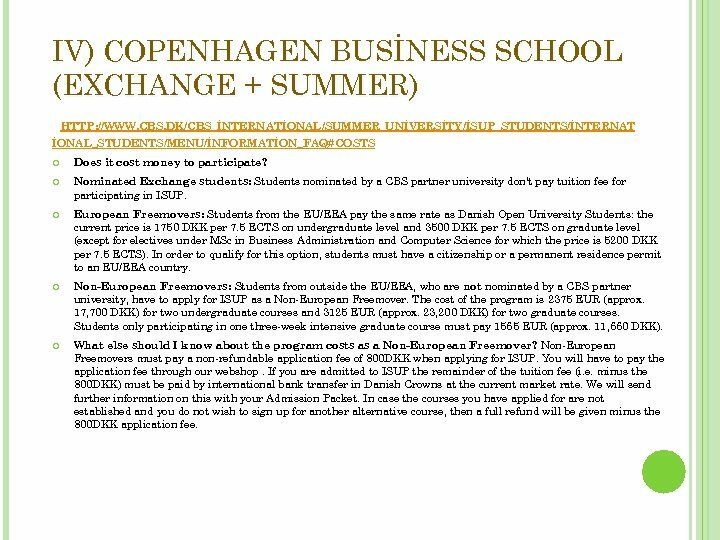 Nominated Exchange students: Students nominated by a CBS partner university don't pay tuition fee for participating in ISUP. European Freemovers: Students from the EU/EEA pay the same rate as Danish Open University Students: the current price is 1750 DKK per 7. 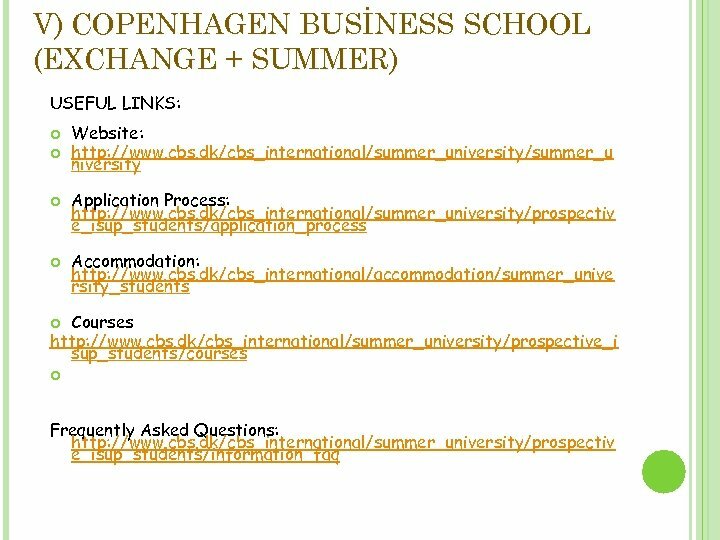 5 ECTS on undergraduate level and 3500 DKK per 7. 5 ECTS on graduate level (except for electives under MSc in Business Administration and Computer Science for which the price is 5200 DKK per 7. 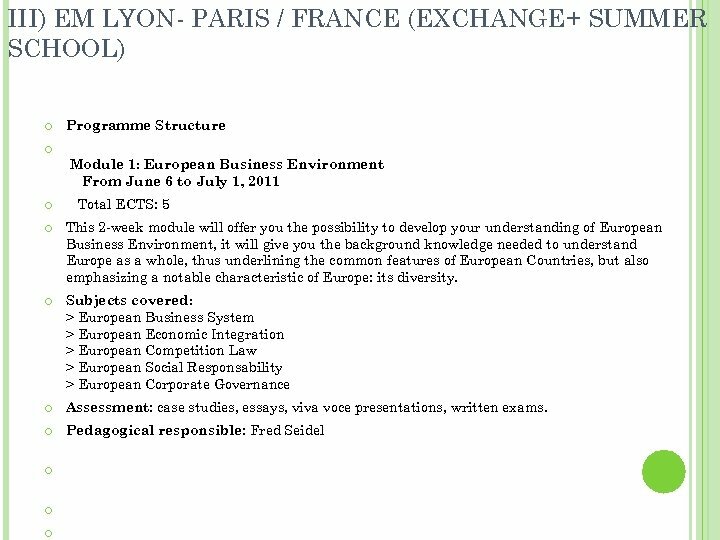 5 ECTS). 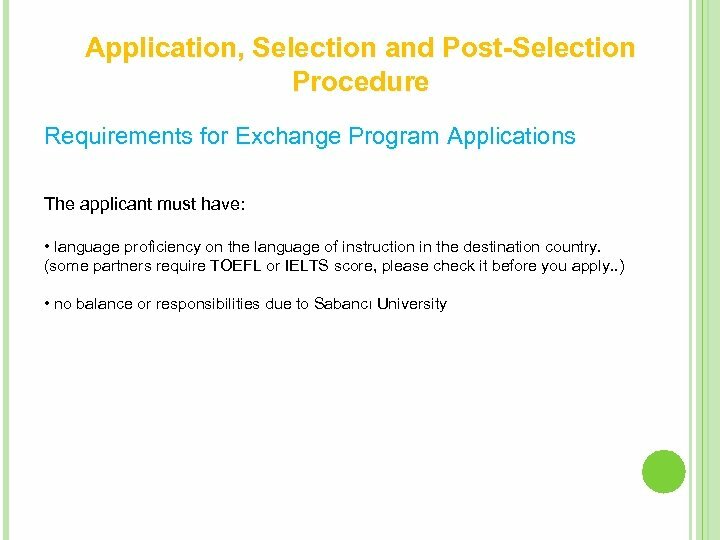 In order to qualify for this option, students must have a citizenship or a permanent residence permit to an EU/EEA country. 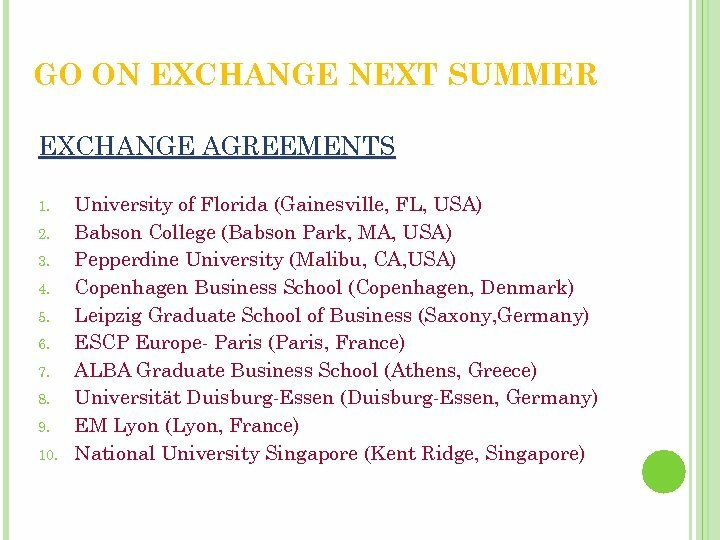 Non-European Freemovers: Students from outside the EU/EEA, who are not nominated by a CBS partner university, have to apply for ISUP as a Non-European Freemover. 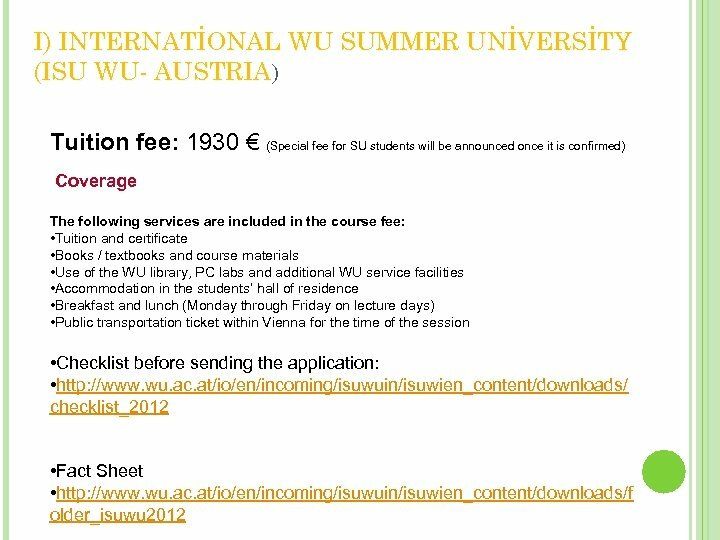 The cost of the program is 2375 EUR (approx. 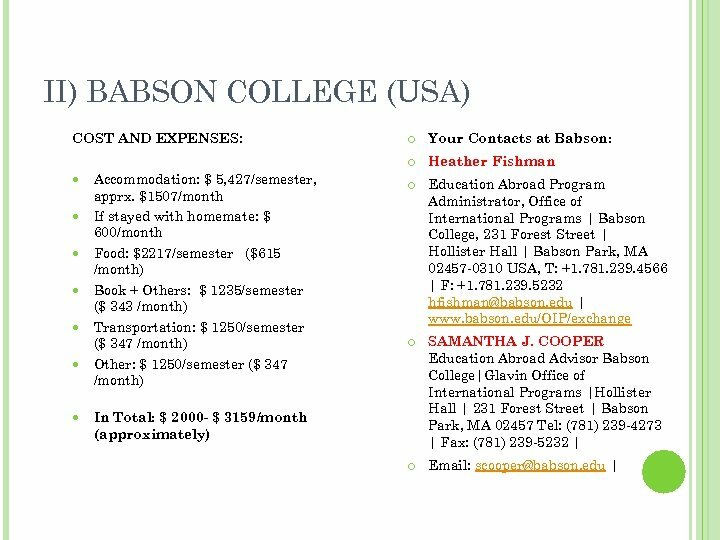 17, 700 DKK) for two undergraduate courses and 3125 EUR (approx. 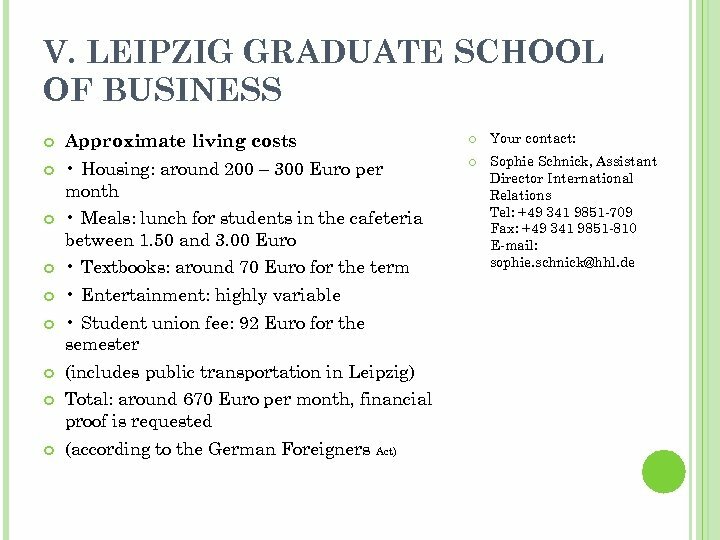 23, 200 DKK) for two graduate courses. 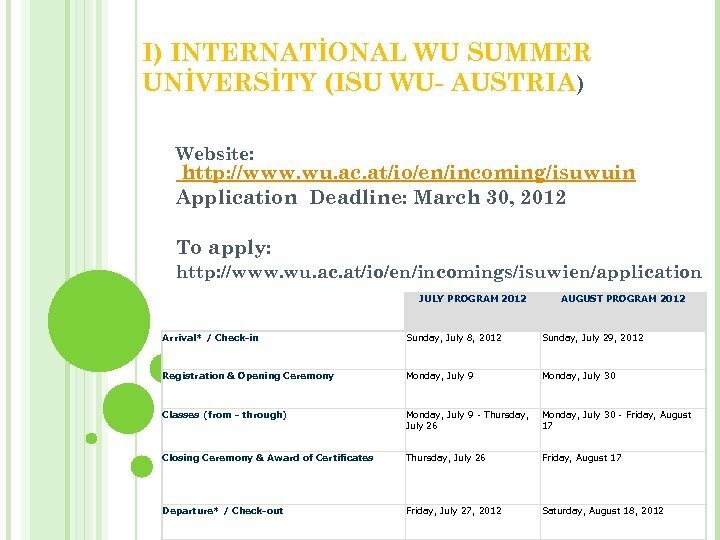 Students only participating in one three-week intensive graduate course must pay 1565 EUR (approx. 11, 660 DKK). 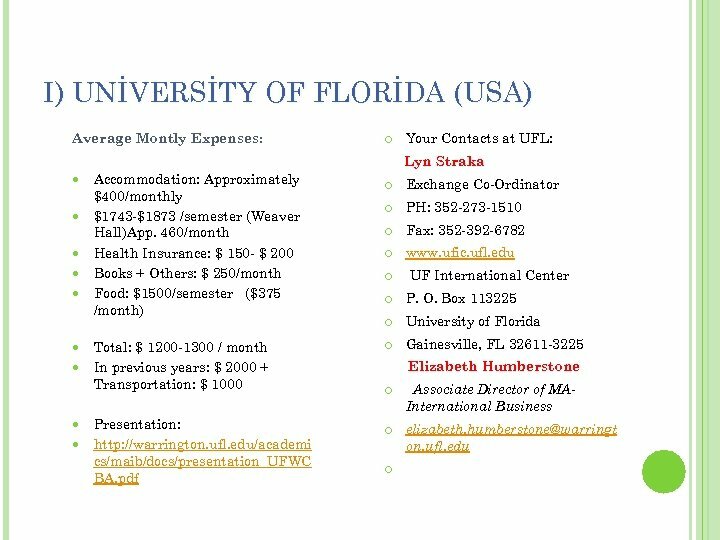 What else should I know about the program costs as a Non-European Freemover? Non-European Freemovers must pay a non-refundable application fee of 800 DKK when applying for ISUP. 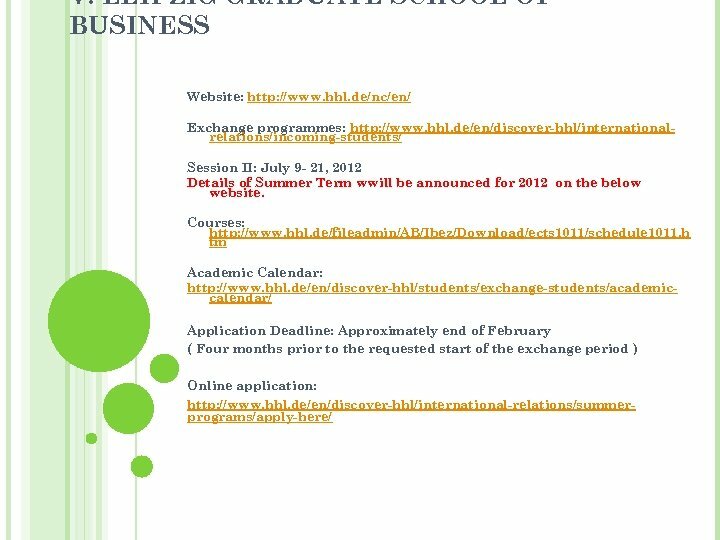 You will have to pay the application fee through our webshop. 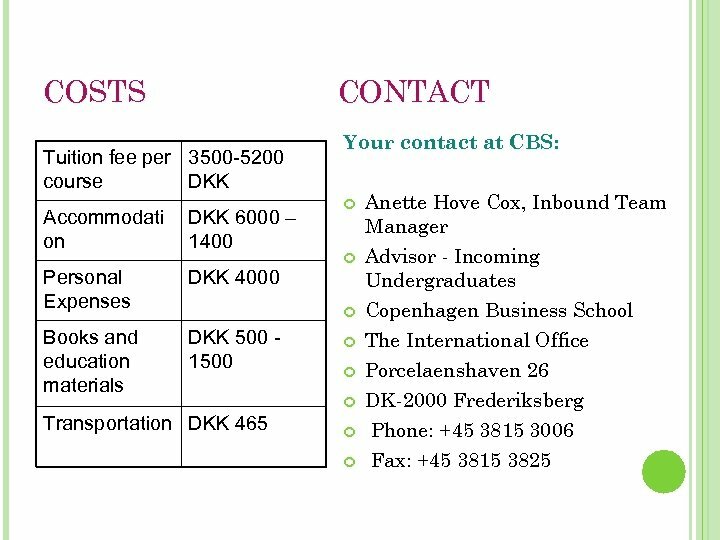 If you are admitted to ISUP the remainder of the tuition fee (i. e. minus the 800 DKK) must be paid by international bank transfer in Danish Crowns at the current market rate. 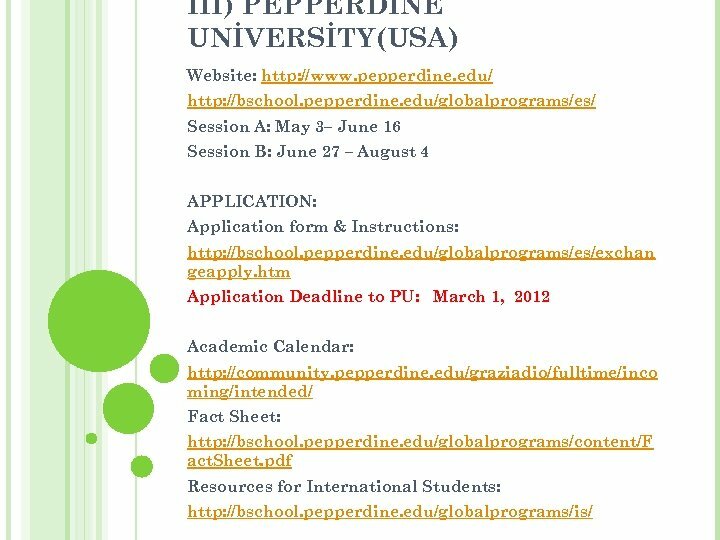 We will send further information on this with your Admission Packet. In case the courses you have applied for are not established and you do not wish to sign up for another alternative course, then a full refund will be given minus the 800 DKK application fee. 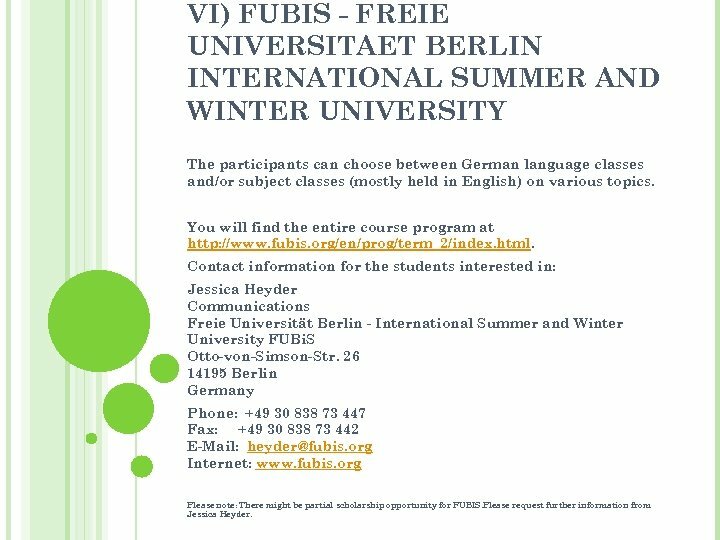 VI) FUBIS - FREIE UNIVERSITAET BERLIN INTERNATIONAL SUMMER AND WINTER UNIVERSITY The participants can choose between German language classes and/or subject classes (mostly held in English) on various topics. 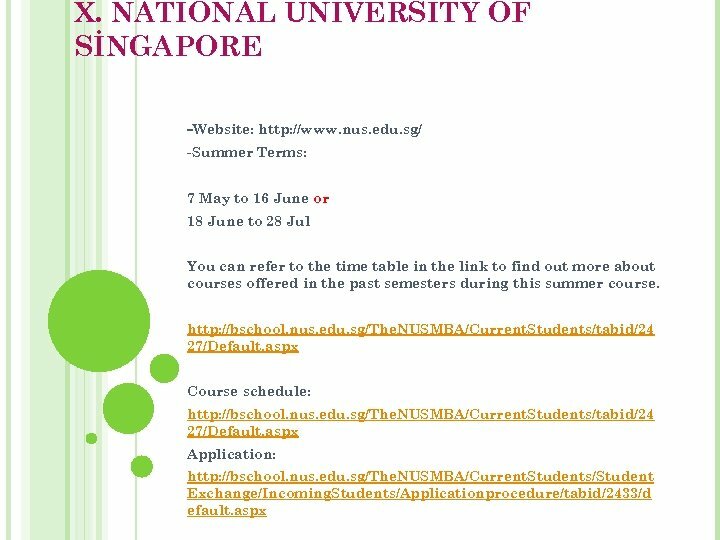 You will find the entire course program at http: //www. fubis. org/en/prog/term_2/index. html. 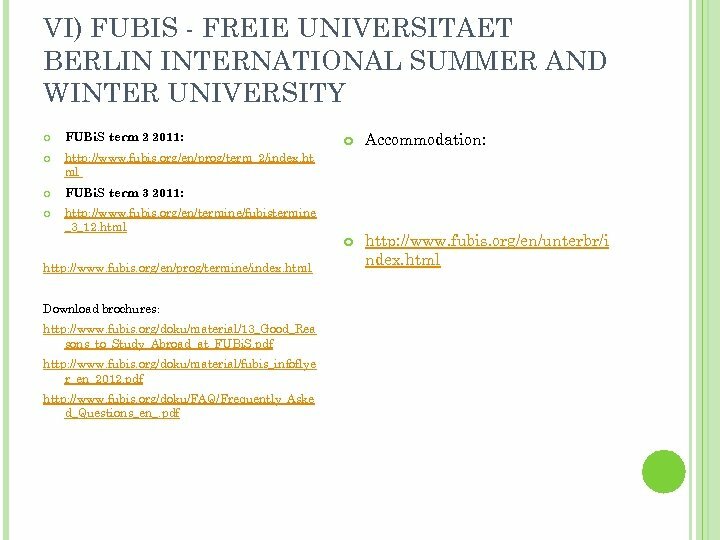 Contact information for the students interested in: Jessica Heyder Communications Freie Universität Berlin - International Summer and Winter University FUBi. S Otto-von-Simson-Str. 26 14195 Berlin Germany Phone: +49 30 838 73 447 Fax: +49 30 838 73 442 E-Mail: [email protected] org Internet: www. fubis. org Please note: There might be partial scholarship opportunity for FUBIS. 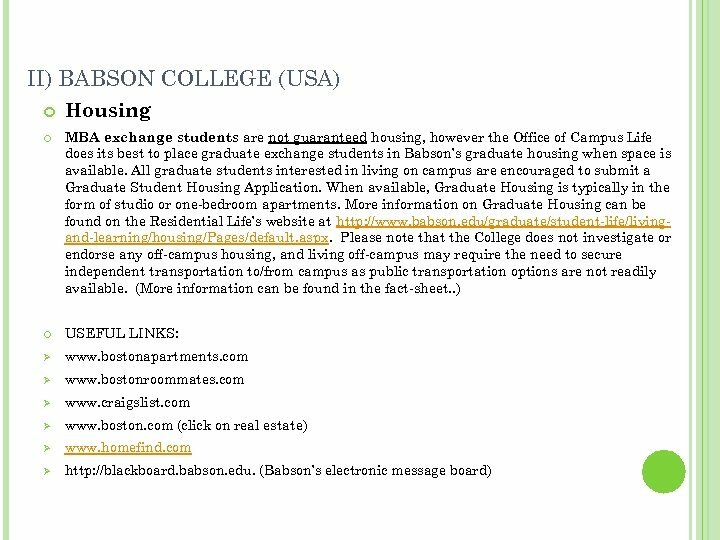 Please request further information from Jessica Heyder.